Dear Miss Manners: I'm attending a black-tie benefit for the Richmond Society for the Prevention of Cruelty to Animals on Oct. 5. Also, I'm a Yorkshire terrier. What's the appropriate attire and etiquette for this event? Sincerely, Fur-plexed. Dear Fur-plexed: Think festive, not formal: perhaps a fitted tuxedo or jeweled collar. You could follow the lead of Ginger McDonnell, Virginia's first dog, who in 2010 made a splash with a jeweled pink dress adorned with pearls. Do choose something that's easy to walk in, as you'll be making an entrance on the Jefferson Hotel's grand staircase. During the banquet, restrain yourself to hors d'oeuvres, such as best bully sticks and puppy cookies. Do keep in mind that it is a privilege for pets to attend a black-tie gala. 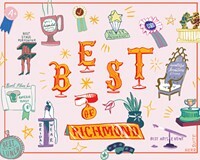 If you're particularly well-mannered, perhaps you'll be invited to the city's other top benefit galas: the whimsical Fairy Tale Ball and the extravagantly produced Richmond Heart Ball.